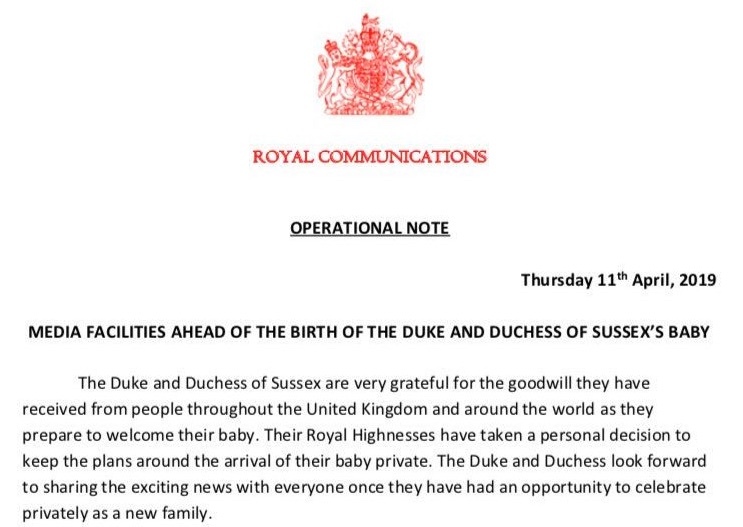 Unofficially, the Duchess does not plan to go to the Lindo Wing for the delivery. There is a possibility the couple may opt for a delivery at Frogmore Cottage, their home in Windsor. 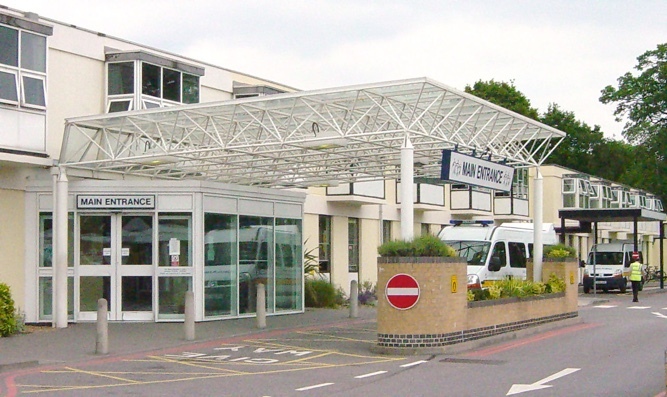 If heading to a medical facility the most-discussed site is Frimley Park Hospital in Surrey, as it is much closer to Windsor. It is a top-notch facility, and where Sophie, Countess of Wessex, delivered both Lady Louise and James, Viscount Severn. There were life-threatening complications when Louise was born one month prematurely and hospital personnel are credited with saving the Countess’s life. Below, a 2016 photo shows Lady Louise (on left), HRH The Countess of Wessex, James, Viscount Severn, and The Earl of Wessex. There will not be a complete information blackout according to the royal press corps. Victoria Murphy explained some details will be released. 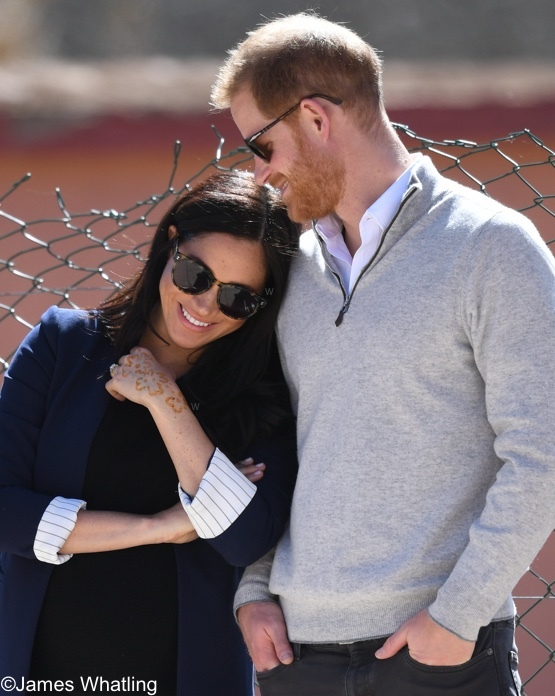 Royal fans will get to see the happy couple with their new baby, however, soon after the birth. Within a few days after welcoming their first child, Meghan and Harry will take part in a photo op with their new baby on the grounds of Windsor Castle. 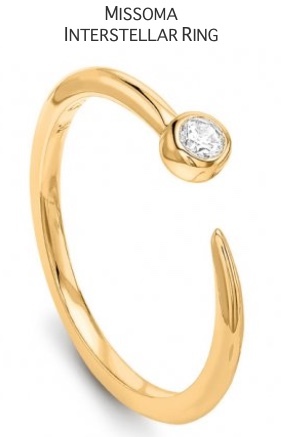 Many of us think the first photo of we’ll see of Baby Sussex is likely to come via the couple’s official Instagram account. …a first son of Harry’s would become Earl of Dumbarton – one of the subsidiary titles Harry received from the Queen on the morning of his wedding. 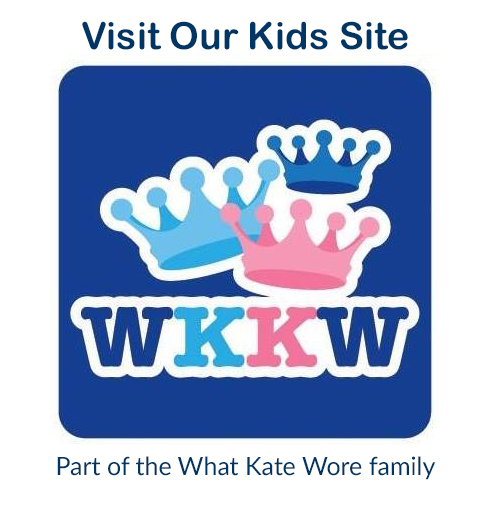 A daughter would be Lady (first name) Mountbatten-Windsor, and any subsequent sons Lord (first name) Mounbatten-Windsor. Members of the royal family have also turned down royal titles before. 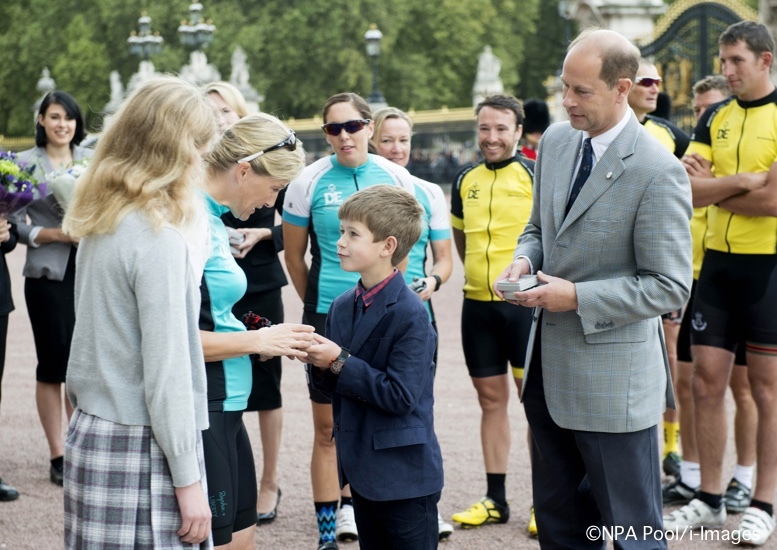 For example, Prince Edward, the Queen’s son, and Sophie Rhys-Jones decided with the monarch in 1999 that their kids Lady Louise and James, Viscount Severn would not be called a princess or prince even though they were entitled to it. 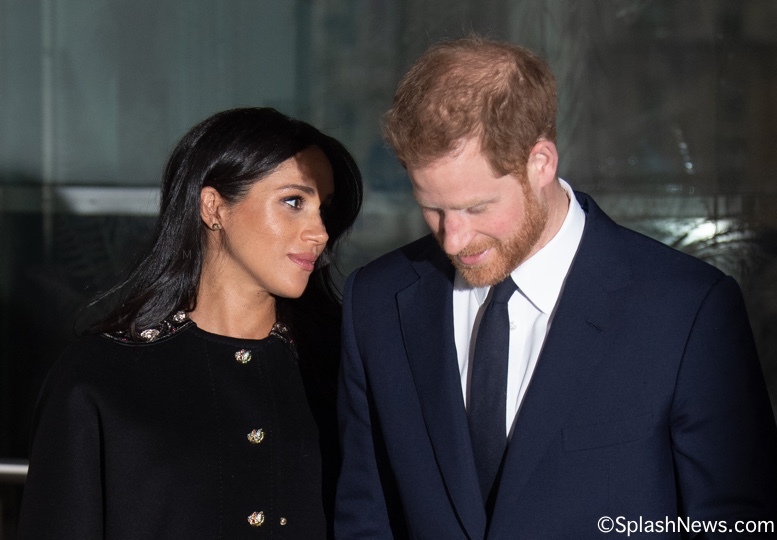 The couple attributed this to a “clear personal wish … appropriate to the likely future circumstances of their children.” With Prince Harry now sixth in line to the throne after the birth of Prince Louis, he and Meghan may also like the idea of a more subdued role for their children. Also today, news about a collaboration Prince Harry is undertaking with Oprah Winfrey. 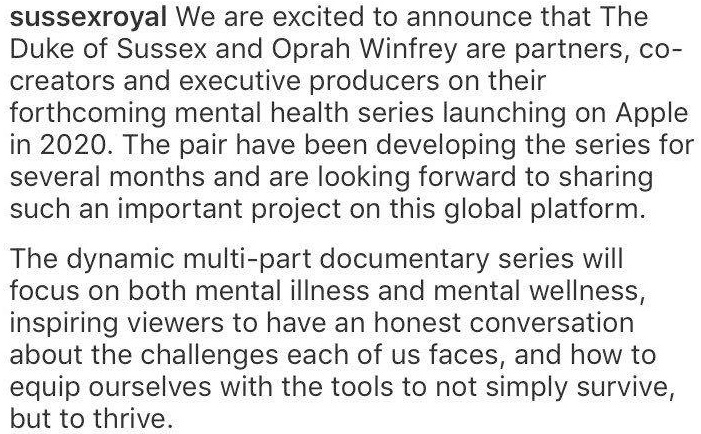 The pair are working on a mental health series that will air on Apple’s new TV+ service. 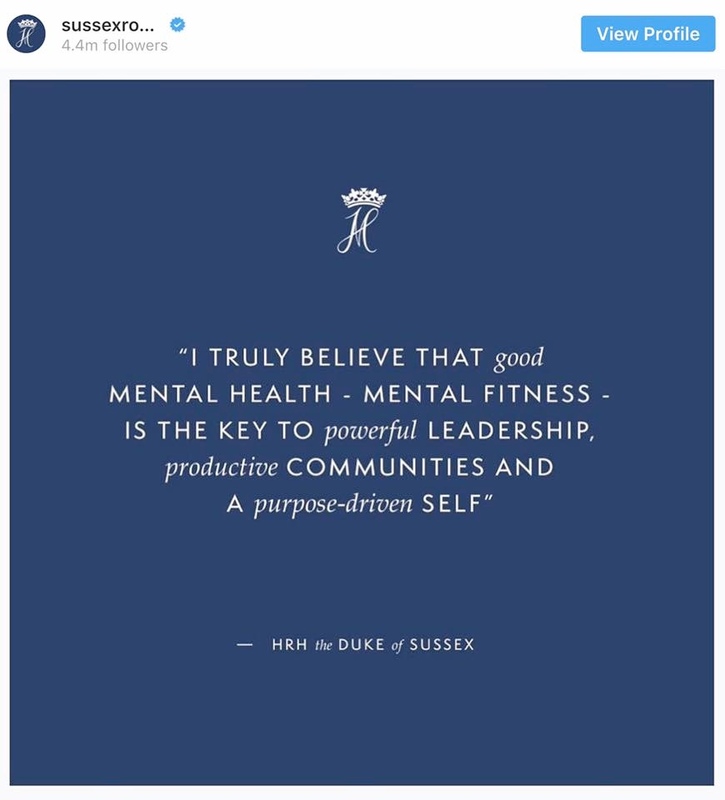 The announcement of Prince Harry’s involvement came via Instagram yesterday. More details from the post. Oprah announced last week she would be working on a mental health series for the the new TV service, saying she wanted to use the platform to help erase the stigma surrounding mental health. In this tweet from ITV’s Chris Ship, you hear Oprah talking about the project and her conversations with Harry. There’s no word if the Duchess will have any official role in the project, but she can clearly offer expert insight and advice. 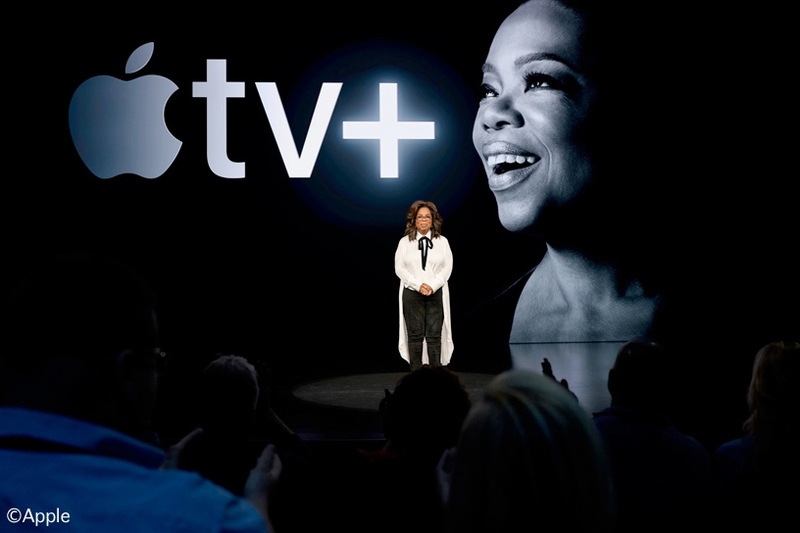 The Apple TV+ subscription service is slated for a Fall 2020 launch. And here’s one some may want to add to their daytimers: a CBS special airing Friday, May 17th. The one-hour special will go behind the headlines and the rumors. 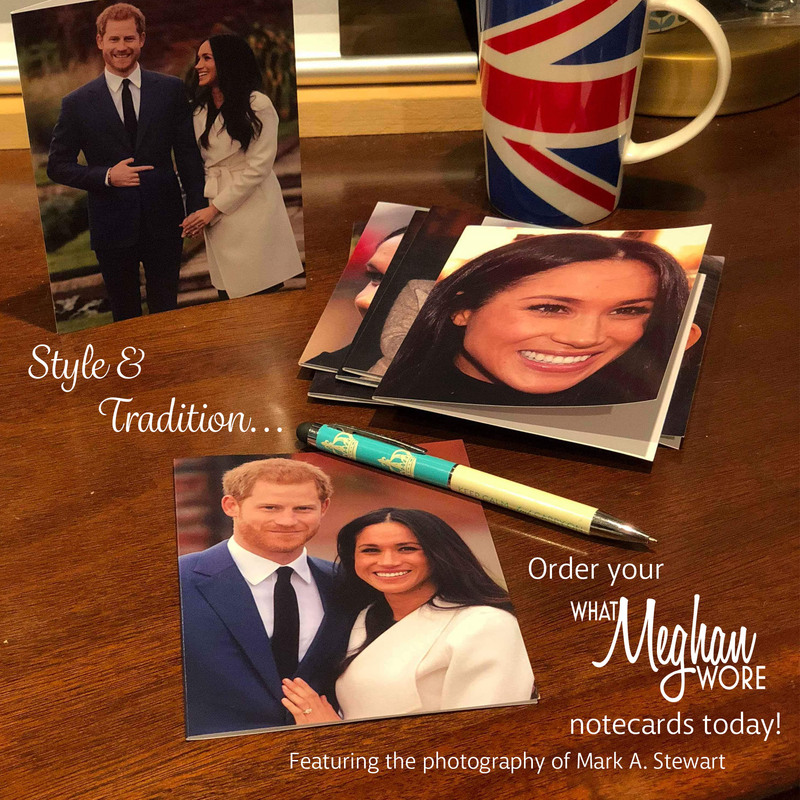 Viewers will hear from royal insiders and Meghan’s friends to learn how the couple has adapted to their new lives together and how they have navigated the positive and negative aspects that come with being royal. The broadcast will also cover “…. 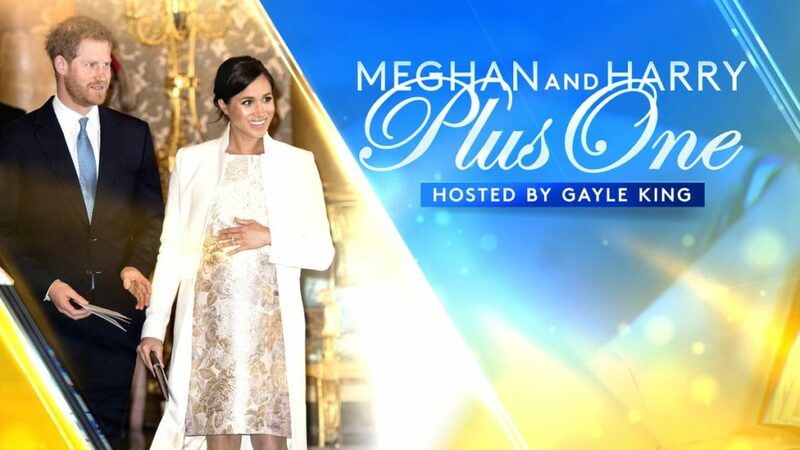 the arrival of the couple’s royal heir who will be the first British-American child to be in line for the throne.” It is slated to air at 8pm EDT/5pm PDT. 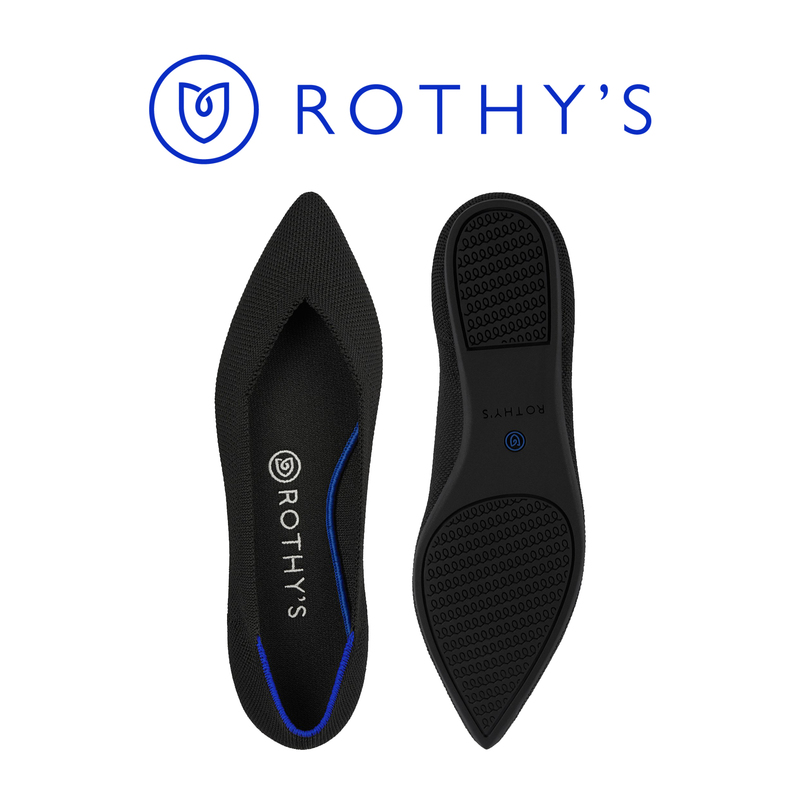 We’ll leave you with a shopping note and a special discount code. 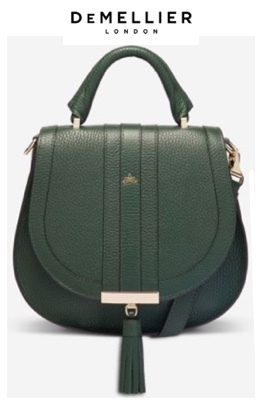 You may recall Meghan carrying the Demellier Mini Venice Handbag when she visited Cardiff with Prince Harry in January 2018. DeMellier has just released the bag in four new colorways: cognac, burgundy, grey and black croc effect. 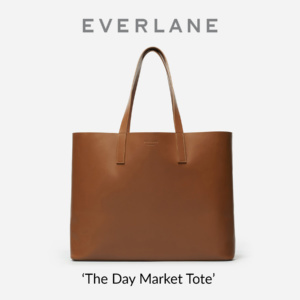 We are happy to share a discount code just for What Meghan Wore readers that is good for DeMellier’s entire line of beautiful bags: use WMWAPRIL19 at checkout for 10% off your order. Hello! 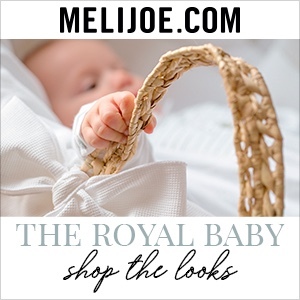 magazine’s special Royal Baby section is now online. It includes a piece by Ainhoa Barcelona that looks at “what it’s really like to give birth at Frimley Park“. 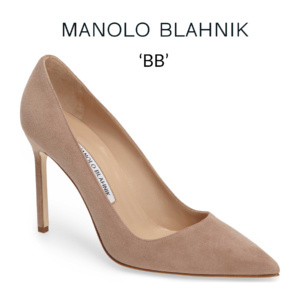 duchess meghan Duchess Meghan fashion blog Duchess Meghan news Duchess Meghan style Duchess Sussex Birth Plan Duchess Sussex blog Duke Duchess children's titles Meghan Demellier Mini Venice Meghan Markle DeMellier handbag Meghan Markle Handbags what megan wore what Meghan wore blog whatmeghanwore will Meghan's child be a Prince or Princess? 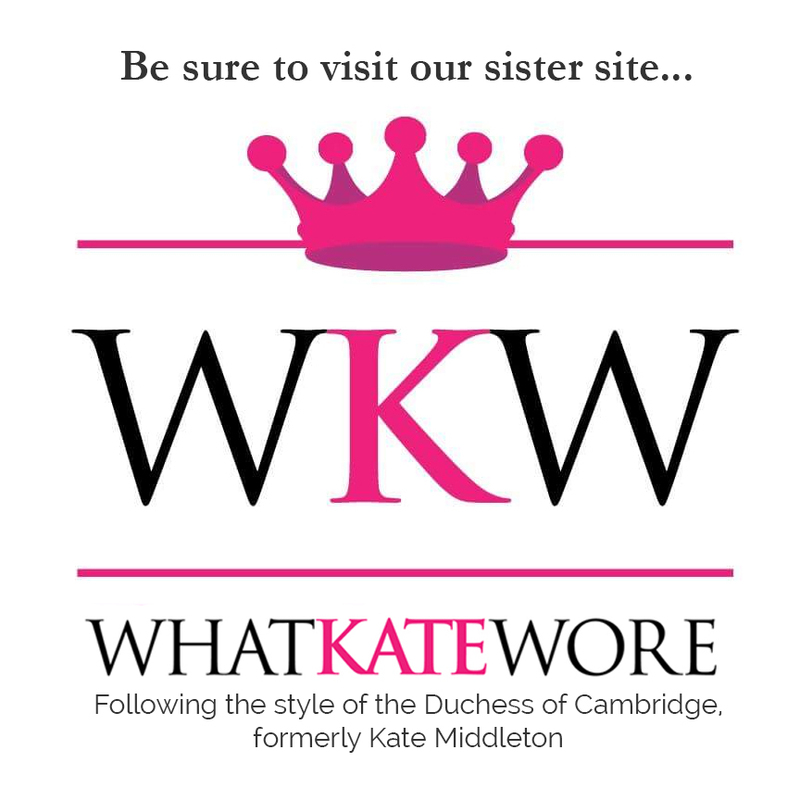 I keep seeing the description of what titles the baby will have – Lord/Lady Mounbatten-Windsor – and it bothers me SO MUCH that only the first son will inherit the Earl of Dumbarton title, and if it is a girl, she won't inherit the Countess of Dumbarton. These outdated sexist title-traditions need to go! Just came here to check (and check again!) if Baby Sussex had arrived. So excited for Harry & Meghan to become parents. I have so enjoyed watching them take on the world together and wish them every happiness. I love that they are forging their own way and navigating complicated circumstances (critical press, family overseas, living under intense scrutiny) and still smiling, being gracious, doing good works and carving out some privacy as well. I find that in the world of social media and digital access, privacy is something you have to carve out and cling to. 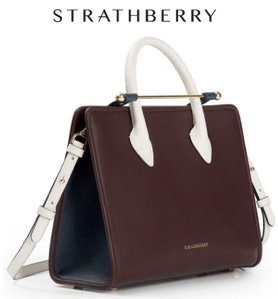 And I say this as an ordinary non-famous person who is not a globally recognized name or ‘brand’. I cannot imagine what it must be like to count down to becoming a mother on the world’s stage. I hope they find that balance of sharing with the public and keeping some things sacred. I wish them all the very best. Grateful for this kind and supportive corner of the internet. Thank you, Susans! A beautiful post…informative and respectful of The expecting couple. Meghan and Harry have a lot going on right now. New baby on the way, new home and new projects. I pray for peace, joy, health and strength to them as they embrace being new parents. I pray that Frogmore will be a true home and refuge for them. Looking forward to a safe and healthy delivery for Meghan and baby. Whenever Harry is ready to show us his new family is fine with me. All of these tidbits seem positive and well thought out to bring about a sense of privacy and personal control yet an openness and accessibility to Harry and Meghan’s life and work. Their official Instagram account will be very helpful in disseminating information and Harry’s collab with supporter, Oprah, on the new TV service and the special hosted by friend, Gayle King, on a major TV network are interesting and smart choices. Can’t wait to view both projects! Love, wishes and prayers for Meghan and Harry as they welcome baby! As always, thank you for detailed, thoughtful coverage that is such a pleasure to read among all the gossip, nasty rumors and general negativity. I’m sure that the Duke and the Duchess will do what’s best for their family and for their baby. I wish them all the best. remember……….the day he or she arrives…….your life will be altered……for good………always….remember who you are, and give the very best of yourselves to someone new who deserves all your love….this is not easy………and is the truest test of a real love……….